Little wonder that the incredible Anand Gandhi who created—no, I won’t use the mundane word ‘made’— the astonishing The Ship Of Theseus, is closely associated with Tumbbad. The visual imagery of this film is incomparable. Perhaps Sanjay Leela Bhansali on a particularly anxious night, would think up the visual language of Tumbbad. Raging and divine, Tumbbad looks like a universe that God created and forgot to put on the human map. The vortex of the violently intense drama are two anti-heroes: greed and a man called Vinayak who fornicates (in a manner of speaking) with an evil God. And if that strikes you as an oxymoron, then be prepared for more of the same. 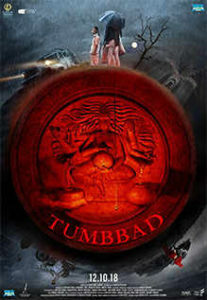 Tumbbad offers a tumble of overweening contradictions. It captures of chaos of a world governed by greed and the rapidfall of a man who knows no other God larger than greed. Co-directors Anand Gandhi and Rahi Anil Barve have dared to enter a world that on paper seems impossible to render visually. Yet, they’ve done it! A large share of the credit for the film’s visual resplendence must go to cinematographer Pankaj Kumar (who also shot The Ship Of Theseus). To translate into visual terms the devastating images of satanic hankering seems like an impossible feat. Just how he film’s visual magnificence is achieved is a thing to behold, beyond any attempt to define or explain. Tumbbad is shot in rain-infested ruins that manifest the dismantling depravity of a civilization on the brink of a moral breakdown. Standing at the centre of this universe of damnation is Vinayak performed with such brutal brilliance by Sohum Shah. Is he not among the finest contemporary actors of India? To handle with such ferocious fluency the diabolic complexities of a character so steeped in greed … and then there is little Mohd Samad as Vinayay’s son.The young actor is required to express an overweening desire to grow into negative adult emotions without losing his character’s innate innocence. Shah and Samad are jointly exceptional. But the film has many other heroes. The bleak landscape bleeds a monsoonal tragedy suggesting ruin and diabolism, Ajay-Atul’s background score is so evocative and articulate, easily the best I’ve heard in a recent Indian film. But above all this film is a writing triumph. It wrenches the supernatural genre from its roots and transports it into a land so eerie and enchanting, I felt I was suspended between a startled sigh and a satisfied swoon. If you think cinema is predominantly a visual medium then don’t miss Tumbbad. It creates images of darkness and despair with the ripe immediacy of tree laden with fruits. Fruits that you may perhaps never taste again.